Herbs delight the senses, and relate to health. Planting a garden with herbs and food potential is one of the most valuable things we can do. With degenerative diseases plaguing many people today, we need to realise that pills and surgery are not fixing the problems. We need to realise that to maintain our immune system, vitality and health, a diet containing living enzymes and antioxidant rich foods and herbs, is essential. 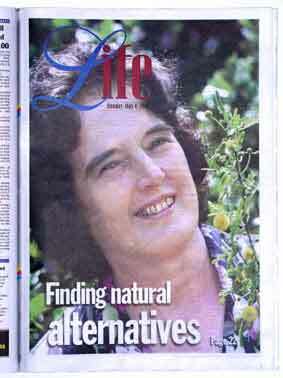 Isabell Shipard’s passion was herbs, and she loved to inspire and share the joys and wonders of natural herbs. With over 30 years of extensive research, knowledge and experience on all things herbs Isabell was one of Australia’s most knowledgable and sought after authorities on herbs. Shipards Herb Farm propagated, grew and sold their herbs locally on the Sunshine Coast. But their large collection was soon sought after by gardeners throughout Australia and internationally. In these books and DVDs you will find Isabell’s extensive research, knowledge and practical experience on growing herbs, collecting and using herbs, spices, fruit trees, rare edibles, seed varieties, sprouts, culinary herbs and medicinal herbs, natural herbal remedies, alternative herbal medicines, natural herbal pain relief, herbal nutrition and Self-Sufficiency and Survival Foods. Australia has waited 20 years for her first home-grown herbal, but here it is at last! Isabell has always been the source of plants and advice for many of us, her admirers. We can be proud of her encyclopaedic work (Acerola to Yucca) on plants, which includes a vast reference background, as well as practical advice. 'Shipard on herbs' is destined to be one of those foundation books that will be in print for the next century. Buy one for yourself, and your grandchildren.